Black Canyon of the Gunnison National Park has long been known for some of the steepest cliffs, oldest rock, and craggiest spires in North America. The Gunnison River has sculpted this vertical wilderness of rock, water, and sky. A grand piece of this wild landscape includes the pristine dark skies. The Park sits on the edge of the great open spaces shared by western Colorado and southeast Utah, making it a refuge for phenomenal dark, protected skies. It is also close to large population areas, giving visitors the distinct opportunity of being able to observe dark skies without having to travel great distances from urban centers. 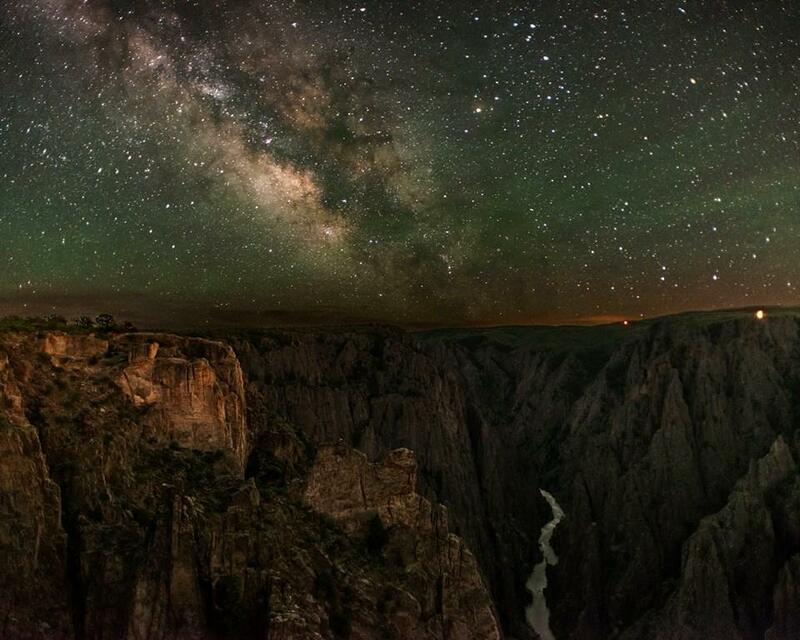 With this support, Black Canyon of the Gunnison National Park was recently nominated and selected to become an International Dark Sky Park by the International Dark Sky Association. This designation is bestowed on land possessing an exceptional quality of starry nights and a nocturnal environment that is specifically protected for its scientific, natural, educational, cultural heritage, and public enjoyment. Black Canyon is the ninth National Park Service unit to receive this great honor. The dedication of the membership of the Astronomical Society was integral in making this designation possible. Park staff and local astronomers have been working for several years towards this designation. Significant improvements were made in park lighting, ensuring that it is night sky and wildlife friendly while still providing for visitor safety. Going forward, staff and local astronomers will conduct dark sky monitoring, outreach programs, news media articles and in-park interpretive programs to continue to engage the public in the dark sky discussion and conservation efforts. In celebration of Dark Sky Park status, visitors are invited to attend astronomy programs offered on the South Rim throughout the month of September. These include evening programs and night sky viewing, along with a special observation of the total lunar eclipse on September 27th. Other astronomy events take place throughout the year, culminating with the 7th Annual Astronomy Festival in June 2016. Over four days rangers, local astronomers, special speakers, and volunteers present programs relating to the many benefits and thrills of dark night skies. The celebration of dark skies has just begun! Western Slope Skies is produced by members of the Black Canyon Astronomical Society. This episode was written and recorded by Park Ranger Nick Myers of Black Canyon of the Gunnison National Park.